For those who didn't know; Jim Obazee was an aggrieved member of The Redeemed Christian Church God. He was one of those who have tried to wrestle power from Pastor Adeboye because they thought it was their time to take over. He was instrumental to getting Lamido Sanusi sacked, so he got President Jonathan's ear. And Lamido was ousted. Then he went for the kill. The church of God he went viciously after. By arrogating all kinds of power to himself at FRC, Obazee who got suspended from RCCG for questions bordering on morals, then went to Latter Rain Assembly. And here is the church the senior pastor has vowed serious sanctions against the church if he ever gets into power. The administrator of this blog watched the Sunday telecast live in year 2005. In this telecast the Pastor of Latter Rain Assembly, Pastor Tunde Bakare derided church offerings as 'gate fees'!! So if you see members of Latter Rain defending Jim Obazee, know where he is coming from. While I agree totally with the call for Christians to go into politics én mass, I would rather call that the church first go into prayers. Haven't we seen sound Christians who went into politics and became compromised by the monstrous spirit of intrigues, tricks and corruption that has taken root and eaten deep into the fabrics our political system and seats of power? This ungodly law that is supposedly signed into law by the National Assembly did not start as a national issue but an expression of grief by one man who became aggrieved by his Pastor and General Overseer. This man is none other than the ousted boss of the Financial Reporting Council of Nigeria. Jim Obazee was a pastor with the RCCG who became envious of the success and influence wielded by the General Overseer, because, he himself is a power hungry man. He became head of the FRC after repeatedly backstabbing his boss to whom he was number two with repeated petitions to the higher authorities against his boss until he had his way and was appointed the substantive boss. He has never had anything good to say about his G. O. He had always spoken I'll of him to whoever cares to listen. While he was still a pastor under the RCCG, he bragged that he had not stepped his foot into the Redemption Camp in many years. He had always complained that the G O has asked other pastors to step down after reaching 70 years when he himself has refused to do so. And was reported to have bragged on few occasions that he would ensure the G O steps down. Let me add that neither he as the boss nor the parastatal he heads (FRCN) has the power to execute the law, but he did. Financial Reporting Council has its jurisdiction whose boundary this man overstepped. Recently, the kangaroo Acts of the FRC he concocted alone to favour him and his draconian regime at the parastatal was repealed by the National Assembly or so it seems. Be he would have none of that. 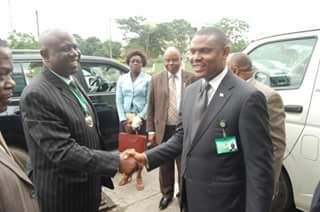 Inside FRC his domineering satanic high handedness style of governance has been a thing of concern in the parastatal. He became so power drunk that he tried to insult the integrity of the G.O. of RCCG, four years ago when the G O asked that he come and see him and he outrightly refused. Only then was his church file as a pastor reviewed and he got suspended from the church. He became all the more drunk with power when he got someone who introduced him to the then president. There, he found an opportunity to present this matter to the president and gave reasons why churches and mosques should start paying taxes. He convinced the president then by running down God's servants. The then president tolerared him because he was an easy tool that came very handy to be used against the then Central Bank governor - Lamodo Sanusi which led to his suspension from office. This drew him closer to the president and tactically he had the president's ear. It was at that point he made his way to express his devilish desire against the church with his G.O. as main target. When the church suspended him and the then president left office, he quickly joined himself to Latter Rain Church and got introduced to the pastor through a member of staff of the FRC who worships there. This he did subtly because of the closeness of the pastor to this present government so he can get introduced to the new President Buhari. That was again a done deal. His staff in the FRC office groans under his hard leadership and cannot speak out because he had held them bound with threats and intimidations. This man who today is an enemy of the church has been implicated in wizardry and witchcraft and belonging to the occult. He has cases of abuse of office and immoral activities going on in court against him which he lost recently. Today, he is laughing because it seems his agenda is playing out. But he did not laugh last. Because it backfired like Haman's agenda against Modecai. And his head rolled down the sloppy gallows he dug for others. These and more he would have achieved had the church not arise to both pray and wrestle power from Obazee first from the realm of the spirit. In Acts 12:1-10, when Herod took James and killed him and no one did anything, he proceeded to take the leader of the apostles- Peter. That was when the church woke up to prayers and intervention came in verse 5-10. And Herod became history. Just as Obazee now is. In Acts 7:1-60, Saul ensured Steven died and no one stood against him, so he proceeded to Damascus for a "mop up operation" but again the Church withstood him in prayers. And Saul ended up as Paul defending the same church even to the point of death by the guillotine. Who said the bill can not be repealed? Why should the church be dictated to by the state instead of the church dictating to the state? Didn't our Lord Jesus say He will build His church and the gates of hell cannot not prevail against it? The state cannot dictate to the church on when the leadership should step in and retire and who to handover to. Thank God we all stood our ground to fight this evil now. Otherwise it would have developed into something worse that will bring regrets to the church. Who knows; they may even proceed further, telling pastors and church leaders what to preach and what not to preach. What pastors should wear and not wear etc. Let's call for a Solemn Assembly and let the priests weep between the porch and the altar until this evil is completely ground to ashes and washed away by the brook of Kidron, like images of Baal. Awake O Zion and trim your light. Arise, O church and shine for your light is come and the glory of the Lord is risen upon you. To God and Him alone be all the glory for exposing the forces behind these cyclones of dust and ashes stuffing the nose of both the church of God critics and builders. Obazeee, we were reliably informed was asked by his boss, the supervising Minister of his parastatal, to suspend the implementation of the law, until further consultation, but with arrogant insubordination, he refused and rebuffed the Minister's directive. Now we understand how and why Obazee was that adamant. Because he was not really seeking to do the right thing for his nation but was out on a vendetta mission.